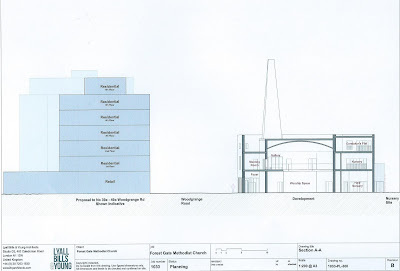 The congregation and pastors of Woodgrange Methodist church, together with the national hierarchy of the Methodist tradition have been working, for about 5 years, on redevelopment plans for the site. These are at an advanced stage and subject to pre-planning consultation. The existing buildings, although only about 60 years old, are looking tired and unfit for purpose, so the Methodists have appointed a series of external professionals to help them re-develop their physical position within the local community. They held two consultation sessions - totalling eight hours - within the church premises, over a cold February weekend. We went along, and this is what we found. The consultation event was fronted by Alaistair Watson of Broadchurch Asset Management - about whom, more much later. 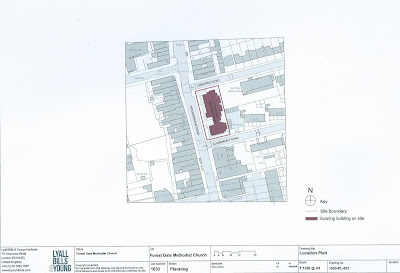 and that "The site has been designated as suitable for residential-led mixed use development (enabling the Church) in the Borough's Local Plan." Mr Watson promised copies of the display boards on show at the consultation event to share with readers of this blog. He has failed to honour this commitment, despite repeated reminders and requests. As and when he chooses to do so, we will happily update this post and add them to it. Only about 25 people had attended the consultation event half way through its opening hours, so few members of the local community will have had much of a chance to see what is proposed for one of the focal points of the local community. 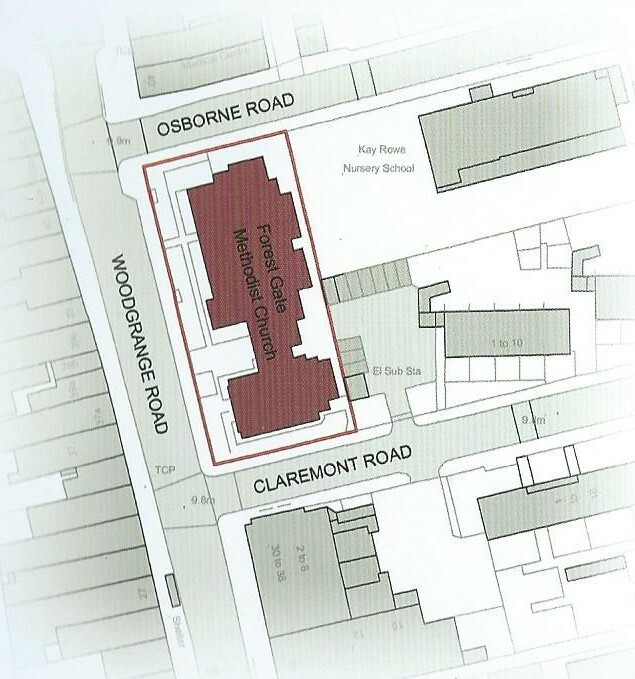 In summary, the church's physical position on the footprint of the existing site will be switched from abutting Claremont Road, to being adjacent to Osborne Road. 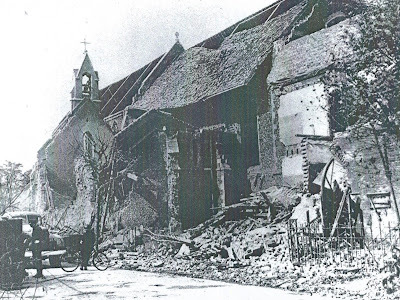 The church will have a tall spire/tower - as the original church on the site had, before it was bombed during WW2. The spire, itself, would be dominated by a huge cross. This literally towers over other buildings in the area, and may now be deemed out of character - even with the taller residential apartment buildings planned for the opposite side of Woodgrange Road (see here). The church, itself, will occupy about 50% of the land on the site - the other 50% will be devoted to housing. 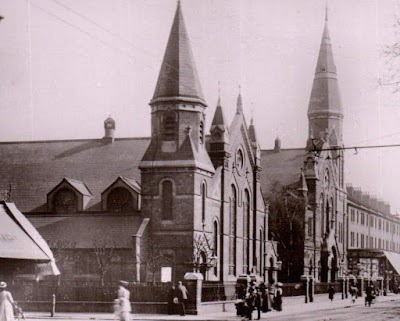 Mr Watson was frank - 'it is the sale of the flats that will pay for the rebuilding of the church'. 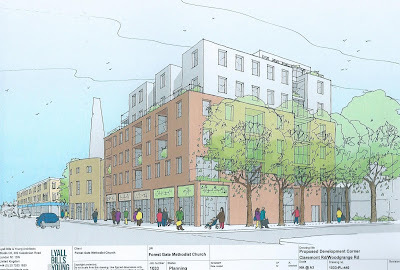 But, the proposals only anticipate that 6 of the proposed flats will be for 'social housing'. The other 27 would be for sale. The consultation leaflet stated that further information about the proposed development could be found here. At the time of writing, this website offered no more information than the leaflet available at the consultation event, other than the information that "The site will be developed by Pigeon Investment Management." Pigeon was established in 2008 and has assembled a management team with extensive knowledge of the regional property markets and a powerful combination of business and property skills. Pigeon manages commercial and residential property on behalf of its investors with a projected end value of over £250m and is currently promoting land for over 15,000 dwellings for its land partners. Herein lies a potential problem for both the developers (Pigeon and Broadchurch) and for would-be Newham Labour Mayoral hopeful Cllr Rokhsana Fiaz. Cllr Fiaz, in her manifesto for mayor plan, aims to get 50% of new-build homes in Newham under council ownership and let at fair rents. Clearly both ambitions - the 80% flats for commercial sale proposals of the developers and 50% council-owned by the potential mayor - cannot be met, unless weasel words can be conjured up. 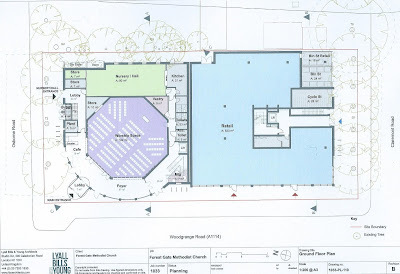 The rebuild proposals would see the church side of the development as a large multi-purpose space that could be used to host a number of community activities, and open up to make it an inviting facility for local community use. 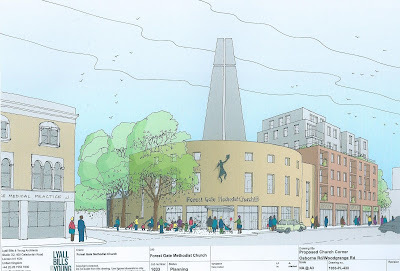 The Grade 2 listed Peter Peri's sculpture, The Preacher, (see here for details), currently facing Woodgrange Road would be relocated to face the corner of Woodgrange and Osborne Roads in the new proposals. There were a number of elderly members of the local congregation present at the consultation event and they are very keen on the proposals. "We pray every day for their success" we were told. 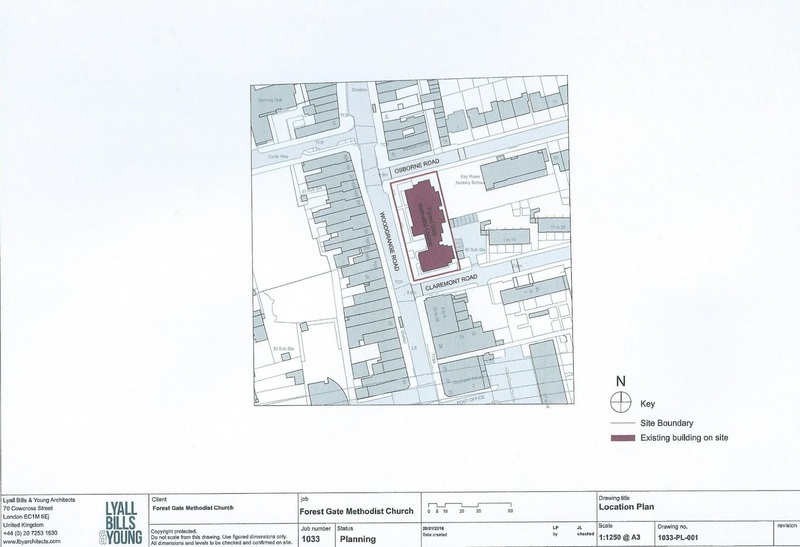 They were keen to point out that they do not want the new development to have walls or fences around it - both from a perspective of being welcoming to the local community, but also because they do not wish it to become a centre of anti-social behaviour (litter dumping, street drinking, needle discards etc). Mr Watson said all concerned were working to what sounds like an incredibly ambitious time table. 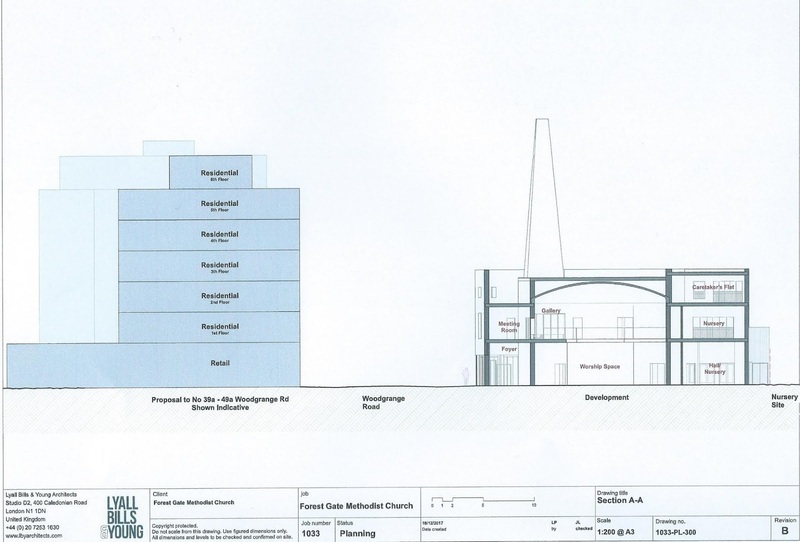 Planning permission within two-three months and project completion with about 18 months. 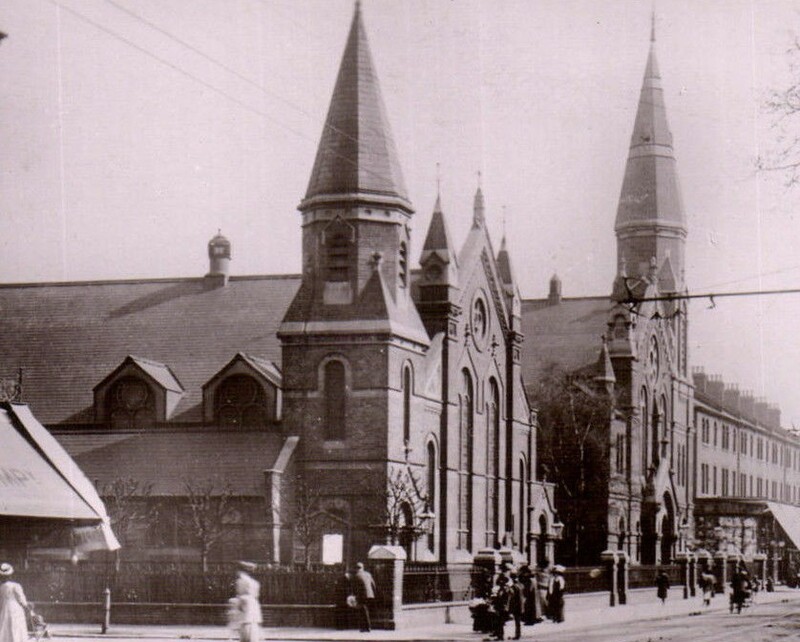 The congregation would co-locate with the Manor Park Methodists for the duration. The consultation event was hosted by Mr Watson, in the name of Broadchurch Asset Management. The company's name is a potentially misleading one, because in financial circles "Asset Management" companies are those who look after/invest large holdings of other people's money - like pension and sovereign wealth funds. Broadchurch is small beer - with almost no assets - either of its own, or apparently managing. Alaistair Watson, 53, is the only current director of Broadchurch-am, which was established in 2013, and doesn't appear to have done much trading since. He has been involved with a string of other property companies (33 at the last count - though only currently active in 4) and has been involved with projects in Essex, the Isle of Wight (see ,here and here) and Suffolk, where he lives. He appears to be a bit of a vintage car enthusiast (see here). 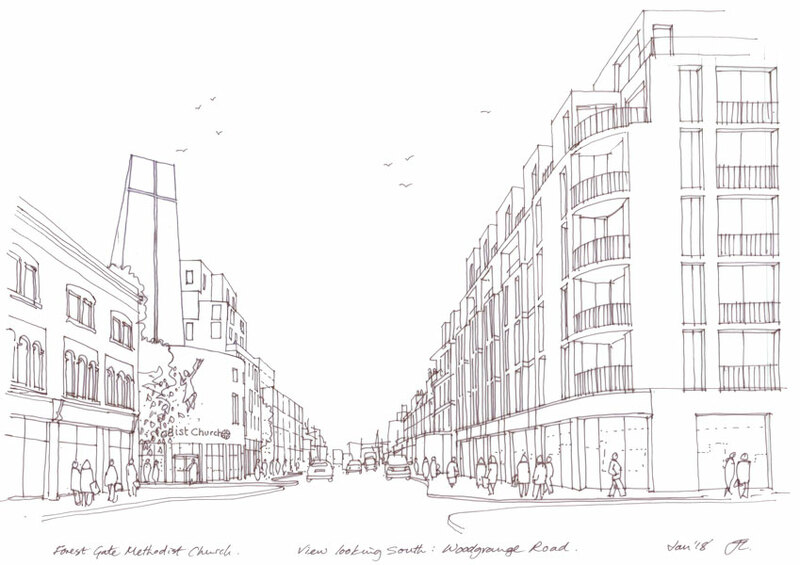 Broadchurch, together with Pigeon, do, however, have plans for a significant development in Hadleigh in Suffolk - see here. In 2005, under the name of Thamesgate Regeneration, Mr Watson managed a big and controversial development in East Tilbury. It attracted a fair bit of press coverage, not least from The Guardian, due to its plans to build a 14,000-home new town on greenbelt land. Colonnade Holdings, another company managed Mr Watson, has run a few successful projects in the Isle of Wight over the last decade or so. But he and this company didn’t have a good time of it when developing a shopping centre in Basildon in 2009, according to three separate reports in the local paper (see here, here and here). people want to see an end to this. The congregation at Woodgrange Methodist church, and Forest Gate residents more generally, will be disappointed to hear that there were complaints were about filth, rubbish, graffiti and broken pavements in the area under development, causing accidents and discomfort, for which Mr Watson had to publicly apologise. 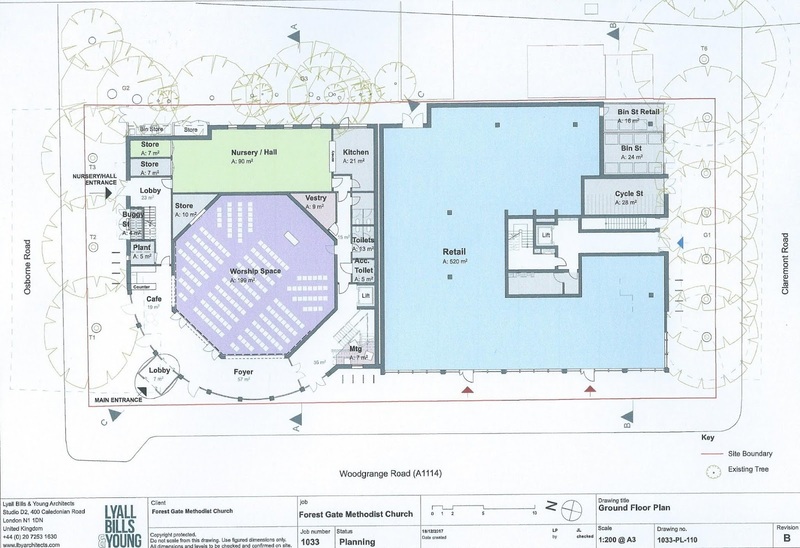 A formal planning application for the redevelopment of the Woodgrange Methodist church was lodged at the end of September 2018. Full details can be found on the council's planning website, see here. Below are some of the drawing submitted as part of the application. Comments about the application are sought by the council, via the site, above, with a closing date of 31 October 2018. 1. Five weeks does not seem long for the consultation process - particularly considering how minimal the first stage of consultation was - see above. 2. 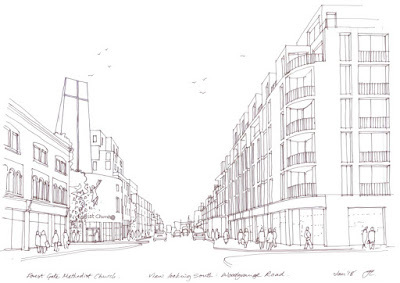 The diagrams below disguise the fact that if accepted, a key part of Forest Gate's main thoroughfare (the flats in this proposal and those in the boarded up shops opposite - whenever the developers get round to building) will switch from being effectively three floors high, to six floors high. This is a significant change to the nature of the area, which the council has failed to consult on, adequately. 3. As mentioned, above, weasel words have been conjured up to disguise the fact that the proposal falls considerably short of Newham's mayor's stated aim of ensuring all new housing developments in Newham are split 50:50 between commercially let and sold properties and those that are "affordable". The proposal, like the original consulted-on scheme, still envisages only 6 of the 33 homes being for "social housing", and 27 not (i.e about 18% social/affordable). 4. All the evidence suggests that 3-bedroom accommodation presents the largest demand for housing in Newham. 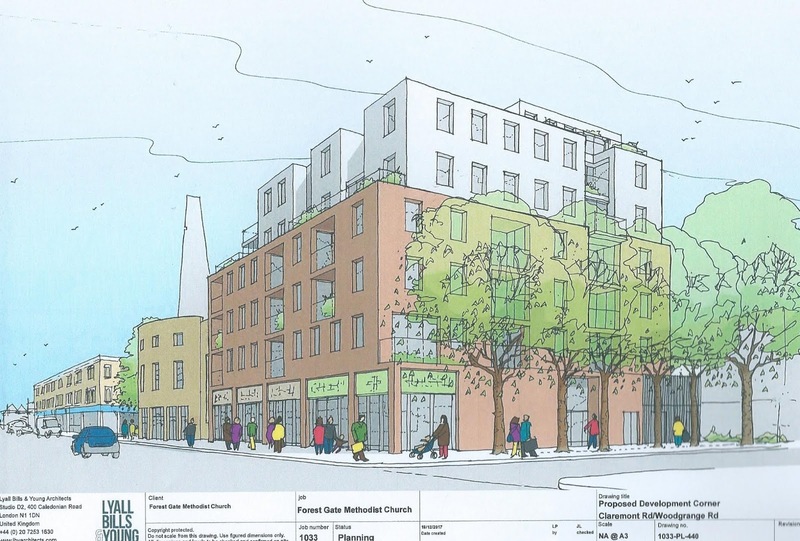 Only six of the proposed flats are 3-bed, nine are 2-bed and 18 are 1-bed. 5. 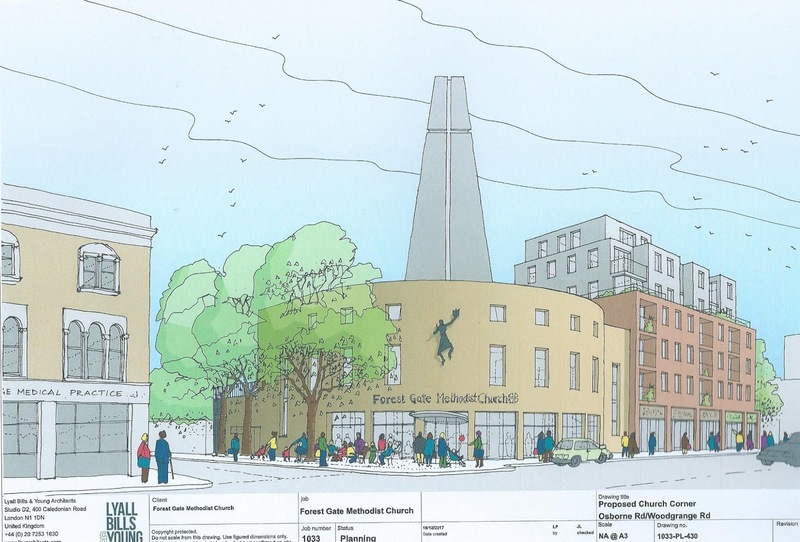 The planning proposals envisages that the building costs of the development will be £10.5m, bringing the equivalent of 97 labour-years of work. The site clearly needs developing. But the there are two obvious problems around the scale of the church tower. Firstly being the taller element in the proposal it will mask the fact that the residential component will not be criticized for what it is: out of scale with the surrounding area. 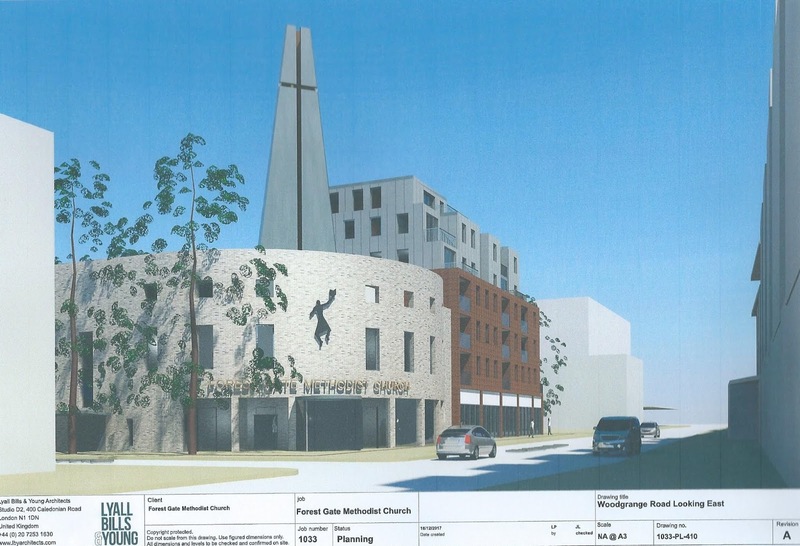 Secondly, and most importantly, the church tower sets a dangerous precedent for tall buildings in Forest Gate. Any future tower (it wasn't very long ago that towers were being proposed in Forest Gate) will make reference to this church tower as a justification for height. The consented development across the road is about as high as is appropriate for a location like this. 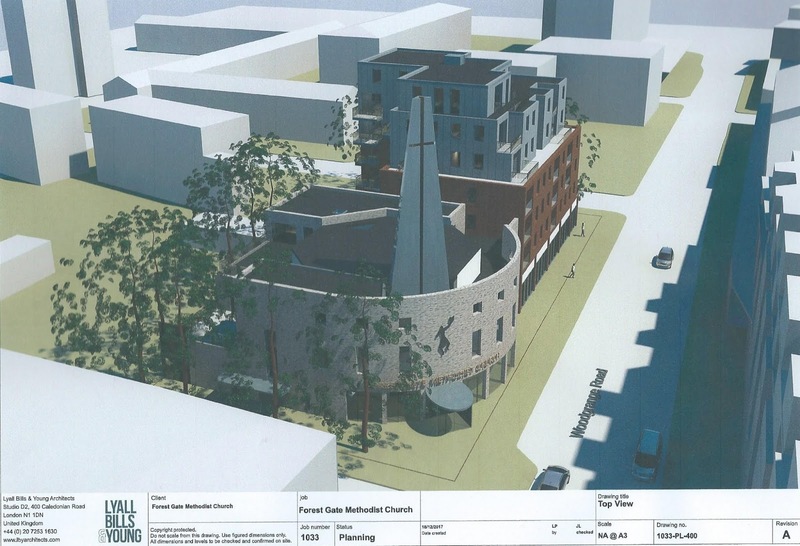 I'm concerned that any tall elements on the Methodist Church site will be used to justify tall and out of scale development on the Durning Hall site when it finally gets developed. Have you contacted the head of the Nursery School about the loss of light etc? I hope after they have redeveloped all of woodgrange road there won't be any bookies left and Newham council does not extend their licences, then perhaps all the undesirables will leave with them. Maybe forest gate will then become the place we will all enjoy living in again.